RecipeTips.com's video demonstration, 'Peppers for Picnic Condiments,' creates an edible dish for your picnic condiments. Hi! This is Laurie from RecipeTips.com. Here is a great idea for your next cookout. 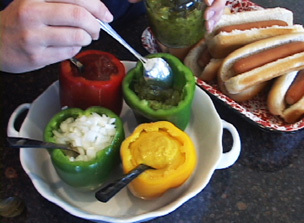 Use hollowed-out peppers in all different colors to hold your condiments when serving hot dogs or hamburgers. Coordinate your condiments to the color of the bell pepper: Put mustard in the yellow, ketchup in the red, and add relish to a green hollowed-out pepper. For more great ideas for your barbecue, visit RecipeTips.com.